In Denver and Seattle – two of the largest recreational marijuana markets in the nation – retail cannabis stores are concentrated in low-income neighborhoods throughout each city. 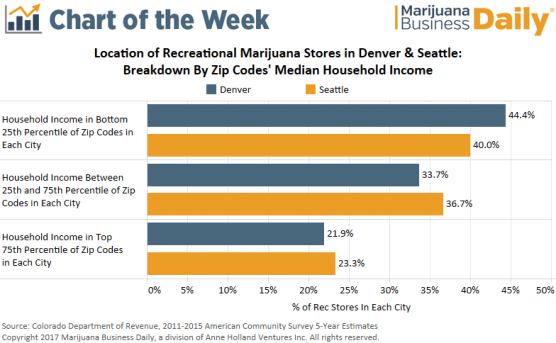 A Marijuana Business Daily analysis of adult-use store locations and median household income by ZIP code found that 40% of rec shops in Seattle and nearly 45% of rec stores in Denver are located in parts of each city where average earnings fall in the bottom 25th percentile. In other words, low-income neighborhoods are home to a disproportionately large number of retail marijuana stores in those two cities. The portion of Denver and Seattle residents located in areas where income is in the bottom 25th percentile is 26% and 27%, respectively, ruling out the possibility that retailers are simply choosing to locate in population-dense areas of the city. So what’s driving this phenomenon? “That’s where the retail space was available,” says Greg Gamet, founding partner in a number of cannabis businesses, including the Denver Consulting Group, Dank dispensary in Colorado and Gold Flora Farms in California. Back in the early stages of recreational legalization, many property owners wouldn’t consider renting to a marijuana business. They viewed it as a major personal and professional risk because of the uncertainty surrounding how the federal government would approach the industry. And in Denver and Seattle specifically, landlords with real estate in middle class or affluent neighborhoods could rent to more suitable tenants outside the industry. So cannabis retailers in those cities turned to low-income areas, where they encountered fewer regulatory hurdles and significant financial advantages. And, generally speaking, those communities didn’t protest the arrival of retail marijuana stores, welcoming the economic development and new jobs these businesses brought in. With lower rent relative to stores located in more prosperous parts of each city, marijuana retailers in those areas realized higher profit margins – a critical component to their initial success. This confluence of factors led to the concentration of retail marijuana stores in low-income neighborhoods, rather than a conscious decision by retailers to locate and target consumers in these areas. Landlords now have more incentive to rent property to marijuana businesses in desirable parts of Denver and Seattle because the general population is more accepting of cannabis use now than just a few years ago. Moving forward, major cities in markets that legalized recreational marijuana after Colorado and Washington state – like Boston and Portland, Oregon – are less likely to see clusters of retail marijuana stores in low-income neighborhoods. Of course those from the anti-cannabiz camp will whine much like the commercials from “Truth” when they say that tobacco stores target low income areas. So be it. I’m glad that this story is shedding light on low rents as a large factor, as well as higher-priced properties were shunned due to business risk. What is missing is an in-depth analysis of demand as it breaks across economic levels. While it might be far easier to do an analysis on $/sf; it will be significantly harder to measure the incomes of those persons buying – which would be interesting to know. -Good article.